Lesley is passionate about connecting with each Patient and making them feel welcome. I trained as a Dental Nurse in Glasgow Dental Hospital and qualified in 1986, and then gained the National certificate in Dental Nursing in 1988. 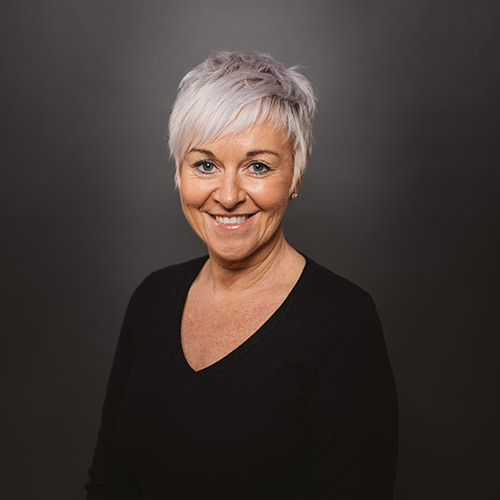 Following six years working with the community dental service in Ayrshire, I decided to return to N.Ireland and joined the team at Affinity as a Dental Receptionist in 1992. I then progressed to Practice Manager in 1996. In 2009 following a year of study I attained the Level 5 Diploma in Management. I enjoy my job immensely and love the interaction with the people I meet. It is a great feeling to know we provide a service which is appreciated by our patients. When I am not at work I like nothing more that a long relaxing walk with my three dogs and spending time with my teenage daughter Aimee.